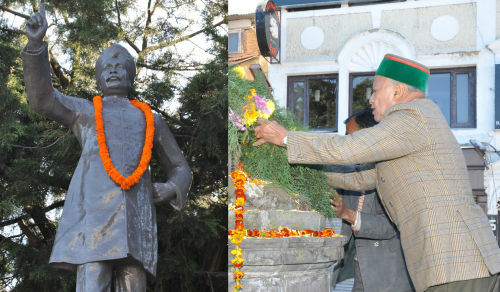 Shimla: Chief Minister Virbhadra Singh today laid floral tributes to Punjab Kesari Lala Lajpat Rai on his death anniversary by laying flower tribute on his statue as Scandal Point here today. Virbhadra Singh said that Lala Lajpat Rai was a great freedom fighter and revolutionary, who made supreme sacrifice for the freedom of the nation. 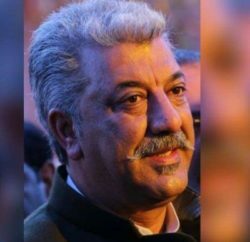 He said that Lajpat Rai led a non-violent protest against the Simon Commission when it visited Lahore on 30 October 1928, but the police assaulted Lala Lajpat Rai, who was grievously injured and laid his life for the sake of nation on 17th November 1928. He said that the nation would never forget his supreme sacrifice and also strive hard to follow the path shown by him. Speaker Vidhan Sabha Brij Bihari Lal Bhutail, Social Justice and Empowerment Minister Dr (Col.) Dhani Ram Shandil, Chairman State Finance Commission Kuldeep Kumar, Mayor Municipal Corporation Shimla Sanjay Chauhan, Deputy Mayor Tikender Panwar, OSD to Chief Minister T.C. Janartha, ADM Shimla D.K.Rattan, former Deputy Mayor Harish Janartha, Councilors and other eminent citizens were also present on the occasion.